Clarence Lamar McHan (December 16, 1932 – November 23, 1998) was an American football player and coach. He played professionally for ten seasons as a quarterback in the National Football League (NFL) for the Chicago Cardinals, Green Bay Packers, Baltimore Colts, and San Francisco 49ers. Born and raised in Lake Village, Arkansas, McHan graduated from its Lakeside High School and played college football at the University of Arkansas in Fayetteville where he was a single-wing tailback. 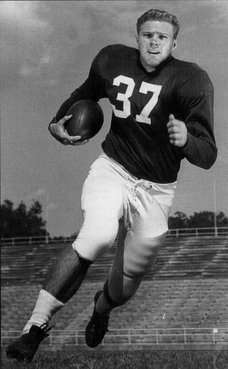 He was ninth in the 1953 Heisman Trophy balloting and played in the Blue-Gray Game in December and the College All-Star Game in Chicago in August 1954. McHan was the second overall selection of the 1954 NFL draft, taken by the Chicago Cardinals. He played with the Cardinals for five seasons, through 1958, but was suspended and fined by the team in November 1956 for insubordination. McHan was traded to the Green Bay Packers in May 1959, under first-year head coach and general manager Vince Lombardi. In 1959, he was the starting quarterback for the first six games, then had a minor leg injury, and was replaced by future hall of fame quarterback Bart Starr. McHan started and won several games in 1960, then was traded to the Baltimore Colts in March 1961, and played behind Johnny Unitas. He was waived by the Colts in September 1963 and was picked up by San Francisco. He played briefly with the Toronto Argonauts of the Canadian Football League (CFL) in 1965. McHan died at age 65 in Jefferson, Louisiana, a suburb west of New Orleans, of a heart attack in 1998. He is buried at Garden of Memories in Metairie. 1 2 "Lamar McHan". The Day. New London, Connecticut. Associated Press. November 27, 1998. p. D8. ↑ "Strong Arkansas back rated as best". Southeast Missourian. Cape Girardeau. Associated Press. November 7, 1953. p. 4. ↑ "McHan sparks Arkansas win". Spencer Sunday Times. Iowa. Associated Press. November 29, 1953. p. 11. ↑ Lea, Bud (September 4, 1960). "'New' McHan set to plague Cards". Milwaukee Sentinel. p. S3. ↑ "Chicago Cardinals fine McHan $3,000 for refusal to drill". Toledo Blade. Ohio. Associated Press. November 21, 1956. p. 15. ↑ "Chicago Cards may relent on $3,000 fine if quarterback McHan shows proper spirit". Milwaukee Journal. press dispatches. November 21, 1956. p. 7, part 2. ↑ "Suspended McHan drills with Cards". November 22, 1956. p. 42. ↑ "McHan traded to Packers". Milwaukee Sentinel. Associated Press. May 23, 1959. p. 1, part 3. ↑ Johnson, Chuck (December 11, 1959). "Starr's comeback secret of Packers' success". Milwaukee Journal. p. 15, part 2. 1 2 Johnson, Chuck (March 28, 1961). "Lombardi trades McHan to Baltimore for draft pick". Milwaukee Journal. p. 14, part 2. ↑ "Packers deal back McHan to Baltimore". Milwaukee Journal. March 27, 1961. p. 1, final. ↑ "Packers send McHan to Baltimore Colts". Pittsburg Post-Gazette. Associated Press. March 28, 1961. p. 22. ↑ "Brodie out six weeks, arm broken". Milwaukee Sentinel. UPI. October 2, 1963. p. 2, part 2. ↑ "Argonauts sign McHan". Montreal Gazette. Canadian Press. March 24, 1965. p. 33. ↑ "McHan signs with Toronto". Milwaukee Journal. Associated Press. March 23, 1065. p. 14, part 2. ↑ "Argonauts cut Lamar McHan". Montreal Gazette. Canadian Press. August 16, 1965. p. 23. ↑ "McHan set". Spokane Daily Chronicle. Washington. Associated Press. February 4, 1981. p. 21.